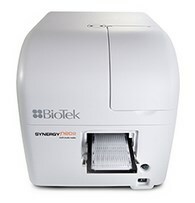 Synergy™ Neo2 Multi-Mode Microplate Reader is designed for speed and ultra high performance, incorporating BioTek’s patented Hybrid Technology™, with its independent optical paths that ensure uncompromised performance. Continuously variable bandwidth quadruple monochromators, sensitive high transmission filter-based optics and up to 4 PMTs provide ultra-fast measurements with excellent results. Advanced environment controls, including CO2/O2 control, incubation to 65 °C and variable shaking support live cell assays; cell-based detection is optimized with direct bottom illumination. Barcode-labeled filter cubes help streamline workflows and limit errors, while the available BioStackNeo plate stacker is the fastest on the market - ideal for high throughput requirements. Powerful Gen5™ Data Analysis Software is included, and features designed for 21 CFR Part 11 compliance are available in Gen5 Secure. There are no threads in BioTek Synergy Neo2 Multi-Mode Reader Reviews at this time.